Genetic mutations affecting a single gene play an outsized role in Parkinson's disease. The mutations are generally responsible for the mass die-off of a set of dopamine-secreting, or dopaminergic, nerve cells in the brain involved in physical movement. The pathogenic variants of the gene, LRRK2, share a common tendency: They cause the protein it encodes to run in constant overdrive, upsetting the delicate balance of a healthy cell. 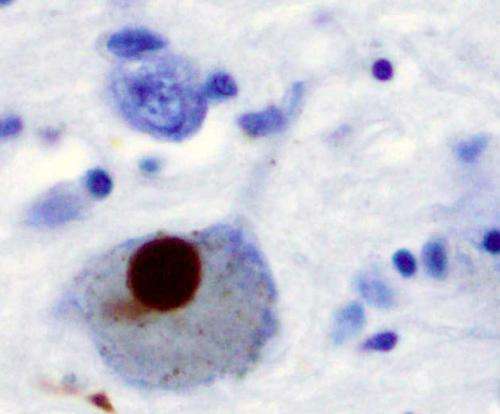 What ties defective LRRK2 so strongly to Parkinson's has puzzled researchers. Now, a study led by scientists at the School of Medicine appears to have pieced together a major part of that puzzle. Suzanne Pfeffer, Ph.D., professor of biochemistry and the Emma Pfeiffer Merner Professor in Medical Sciences, is the senior author of the study, which was published Nov. 6 in eLife. The lead authors are postdoctoral scholars Herschel Dhekne, Ph.D., and Izumi Yanatori, Ph.D. Most cases of Parkinson's are sporadic, meaning the condition seems to hit individuals at random rather than run in their families. But even in sporadic cases, genetic mutations can figure in. Of the numerous LRRK2 variants suspected of predisposing people to Parkinson's, so far five have been solidly identified as boosting Parkinson's risk. Taken together, these LRRK2 mutations have been implicated in about 10 percent of inherited cases and 4 percent of sporadic cases among Caucasians. Just a single one of those mutations is responsible for about 40 percent of familial Parkinson's cases and 13 percent of sporadic cases among Ashkenazi Jews. Drugs targeting the LRRK2 protein are already in clinical trials for Parkinson's, despite the absence of a real understanding of its role in the disease. Pfeffer and her colleagues have previously reported that mutant LRRK2 renders some classes of nerve cells deficient in their ability to create an important subcellular structure called the primary cilium, which acts analogously to a radio receiving tower, except that instead of sucking in waves of electromagnetic radiation, the primary cilium slurps up signaling substances from its surrounding environment. It's easy to imagine how a cell lacking such a receiving tower could go astray. But Pfeffer's team wanted to know why the defect preferentially leads to Parkinson's disease as opposed to a number of other neurodegenerative disorders. In the new study, the researchers unraveled a complicated molecular explanation: First, cells lacking primary cilia are unable to respond to a powerful chemical messenger known as sonic hedgehog. Second, the scientists learned, the types of cells that can't make a decent primary cilium when their LRRK2 protein is in overdrive include a set of cholinergic nerve cells, so named because they secrete acetylcholine rather than dopamine or other substances that signal nerve cells. These cholinergic cells have a close working relationship with the dopaminergic cells implicated in Parkinson's disease. When the dopaminergic cells need some help, they pump out sonic hedgehog. Cholinergic cells with functioning primary cilia respond by triggering the secretion of a molecule that keeps dopaminergic cells healthy. Without that molecule, dopaminergic cells become more vulnerable to dying. So an LRRK2 protein in overdrive leads to no primary cilia, which leads to no response to the sonic hedgehog signal, which leads to no chemical help for the dopaminergic cells and, therefore, to their death. Could the breakdown of that support system underlie the unrelenting loss of dopaminergic cells in Parkinson's? Pfeffer's lab is now hard at work studying that very question.